REGISTER NOW For Lucky Napkin LIVE and we’ll show you what entrepreneurship feels like from the inside. 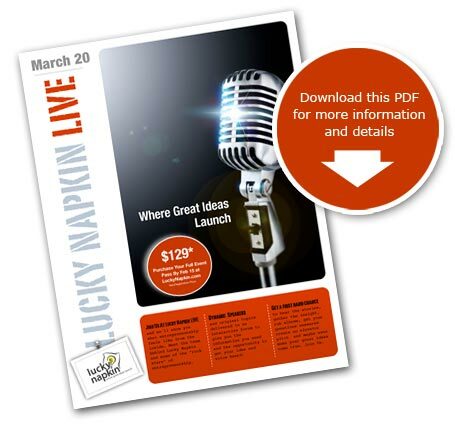 Meet the team behind Lucky Napkin and some of the “rock stars” of entrepreneurship. Dynamic Speakers and original topics delivered in an interactive forum to give you the information you need and the opportunity to get your idea and voice heard. Get a first hand chance to hear the stories, gather the insight, rub elbows, get your questions answered create an elevator pitch and maybe even make your great ideas come true. Join Us! Get a first hand chance to hear the stories, gather the insight, rub elbows, get your questions answered create an elevator pitch and maybe even make your great ideas come true.